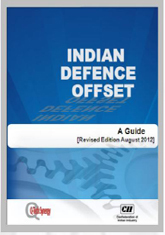 “Indian Defence Offset”, aims to readily provide all the basic references required to comprehend the Indian Offset Policy in simple terms, along with practical information. The subject is still evolving. The book explains the sequence of actions which need to be adopted and pitfalls that could be avoided. In order to help the foreign OEM, the book includes the programme management in defence, Selection of Indian Offset Partners (IOP) and (Defence) Industrial Licensee Indian companies. An attempt has been made to consolidate various issues & concerns and the views shared by selected IOPs.